DevOps improves efficiencies by bringing SAP Dev and SAP Ops teams together in the larger business context to coordinate their work throughout the service lifecycle. On large SAP systems, tight integration between components is crucial. The challenge is to leverage, not lose, existing third-party software investments and avoid disrupting user-accepted business processes and procedures. 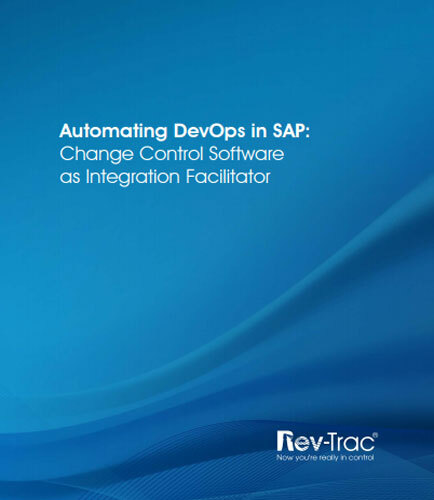 Change Control is emerging as an ideal integration facilitator for automating DevOps in SAP. Implementation of modern technology in our daily life is a credit to digital transformation success. Research shows that only companies with a culture open to changes can leverage digital transformation to the maximum. For a successful digital transformation, the CIO of the company has to be more involved with the changes in business vision, IT infrastructure, and investments. The CIO has to understand the process completely as well as take the initiative to be the leader in the whole structural conversion to digital transformation. Key Takeaways from this whitepaper: Customer obsession is the need of the hour for digital transformation success. Digital disruption of mobile experience has enhanced customer’s expectation. Collaboration within the company can strengthen customer experience, the solution to successful digital transformation. Swift analysis of customer expectation by experimenting with new information types. Technology and business leadership are the major criteria for the CIO towards embracing digital transformation. Finding ways to control data storage growth and manage data effectively is one of the industry’s most important tasks. Though storage vendors regularly introduce new technologies to address this issue, the challenge in data storage management is to manage costs while ensuring the needs of the business continue to be met. This whitepaper highlights the effective methods to control storage growth, their benefits and how you can profit from them. To implement cost effective storage management systems that are automatic and self- sustaining overtime. By introducing storage management policies and reducing the rate of storage consumption, the use of storage resources can be effectively managed. Download this whitepaper to acquire insights on implementing the below methods in controlling the storage growth. Charging the consumer accordingly for the consumption of resources. Increase user awareness and participation by triggering users and make them aware of their use of storage resources. Setting a limit on how much storage any one user can consume. Automate routine storage cleanups. Focusing on collecting appropriate data. By definition DevOps (a mutual compound of "software Development" and "information technology Operations") is a term used to refer to an arrangement of practices that insists on communication, collaboration and integration between both software developers and data innovation (IT) experts to automate the process of software delivery and infrastructure changes.